The Cranes are coming! Stay at the Oldfather Guest House and Sandhill Cranes could be in your front yard...right outside your window. The Oldfather Guest House is your window to the migration of the Sandhill Cranes. Enjoy a glimpse into the natural lives of half a million Cranes as they pass through Central Nebraska on their way to the northern breeding grounds. This is Crane Season, from about mid-February through mid-April. Here's your invitation to see this unique spectacle in a lifestyle that suits the quality of your life. Come to Kearney, Nebraska and stay in the private Oldfather Guest House. 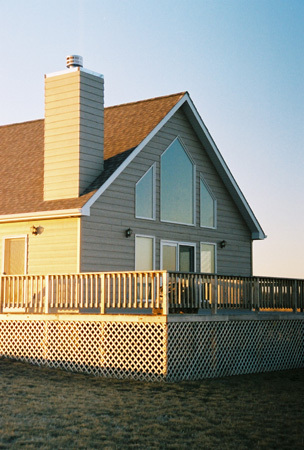 Located near the banks of the Platte River, the Guest House is situated amid the corn fields the cranes feed in during their stay in Central Nebraska. This lovely home is completely furnished and sleeps up to 6 people. Even though Kearney offers you an opportunity to do some spectacular birding, you'll enjoy the other area attractions. Be sure to investigate our recommendations.